Old Hispanic villages stood in the way of creating Navajo Lake. The rising waters won, but a holy place was saved. Above: Father Jim Walker talks to visitor about the church&apos;s history. THE MORNING SUN HAS YET TO WARM the sandstone bluffs, hoodoos, and rockslides of the San Juan River canyon and the twisting road that leads to a lonely little chapel. The building is hard to miss, set so high on a chewed-up hill. I aimed to arrive first on this important day, but woodsmoke already chugs from the church’s chimney, and a pickup truck sits out front. The December chill hastens my stride toward the white-plastered adobe walls. Inside, a sole parishioner faces the altar, silently praying. I feel an awkwardness envelop me, the visiting stranger, a non-Catholic in a locals’ shrine. The woman praying, I know, is Susan Archuleta, mayordomo of this church, Our Lady of Guadalupe, a mile west of Navajo Dam in New Mexico’s northwestern corner. I also know she has work to do. “Can I help?” I ask when her prayer is done, the sound bouncing off well-worn pews and a pressed-tin ceiling. She nods at the door. Soon enough, I’ve wrestled Saint Anthony from her truck and wriggled him onto a shelf already crowded with the prayer mementoes of other drop-in strangers over the past months. “He’s a stout little fellow,” a satisfied Archuleta says, patting the bulto’s belly. For 364 days of the year, Anthony and the church’s other statues live in her bedroom, down the road in Turley. Month by month, Archuleta and her family ensure that the church’s belongings are safe, its walls stand sure, and its door remains always unlocked. But their task requires more than mere maintenance. Together, they are the earthly defenders of the ghosts of another time, the villages that lined the canyon beginning in the 1870s—Los Martinez, Rosa, Los Pinos, Los Arboles. They protect the intangible memories of bountiful orchards, mule pens, fiestas, funerals, dances and romances, acequias and droughts, the sinners and the devout. They have committed themselves to this place—and the places that once were—so that none may be forgotten beneath the cold, deep waters of Navajo Lake. Its construction, beginning in the late 1950s, marked the final days of village life here. Residents, poorly compensated by the federal government, scattered to nearby Aztec, Bloomfield, Farmington, and farther—Colorado, Nevada, Oregon. Although construction of the earthen dam clawed off most of the church’s broad hill, for some reason the contractors never demanded the portion it perches upon. To keep it holy, a consecrated place of worship, the church, just once a year, welcomes back the families—their children, grandchildren, and great-grandchildren—along with strangers like me, to celebrate a Guadalupe Mass. Today is that day. I HAD TRACED A DIFFERENT ROUTE to the church the day before, approximating the trail that traveling priests once followed on horseback: straight west from Dulce, across the forested eyebrow of New Mexico, along mountain roads whose beauty and peril alone are enough to draw a person closer to God. These days, that route includes curling up the long sweep of hill that tops out on Navajo Dam, the bulwark of a 37-mile-long fisherman’s paradise. You can see the church from there—back down another hill, through the valley, and up a short, steep road—and perhaps imagine the lives and even the deaths that were uprooted. Cemeteries from the villages in the lake’s path were dug up, and the bodies reinterred in Guadalupe’s graveyard. Next to nothing else was left behind. Some reaped only a sixth of what their land was worth, and nothing for their water rights. Thrifty folks pulled every fence post and roofing nail they could. Los Martinez sat to the west, on the dry side, but the U.S. Army Corps of Engineers needed to scrape land from it, too. Residents moved their chicken coops and window frames along with everyone else. An iron-pipe fence now surrounds the church, and bunched-up beds of old irises still flaunt green leaves in December. An apricot tree on the west wall bears nostalgia-inducing fruits each spring. Behind, the graves bear the lyrical names of a New Mexico sadly past: Francisquita, Atanacio, Ramoncita, Rafelita, Erminia. On this day before the Mass, I find Delia Velasquez at the church, along with her niece, Evelyn Archuleta, and Evelyn’s son, David, a jack-of-all-trades who provides the horsepower for the upkeep. He can build, weld, and butcher. “I even do my own sewing,” he says, smiling. He’s been trimming weeds while his mother and aunt clean inside the church, built in 1920 to replace a morada of Los Hermanos, the lay fraternity of Penitente brothers who once oversaw Catholic rites in place of distant priests. Velasquez was born in Los Martinez and later married a boy from Los Pinos, where they lived until 1956, when preparatory work for the lake made it hard to even get to their home. Finally, the family removed the statues and let anyone drop in. The vandalism stopped. Lookie-loos got their peek. Prayers were offered, fetishes left behind. A guest book reveals visitors from Ohio, Kansas, Pennsylvania, and New Zealand. “We have everything from Mormons to atheists come through,” David Archuleta says. Thirty-some years ago, someone stole the cast-iron steeple bell, and he’s still unhappy with the thunk of the aluminum replacement. Old-timers say the peals from the original one could be heard from miles away. Despite the family’s ministrations, the adobe walls must reckon with the ravages of time. Some of the plaster’s cracks bear signs of repair; others are just beginning to raise concerns. Susan Archuleta, Delia Velasquez, and their other sister, Teresa Martinez, lament that they’re too old for climbing ladders and give thanks that David still shows up with his construction brain and brawn. Duty compels them to continue, as if the graves bear a mandate, calling the families home. PEOPLE BEGIN ARRIVING FOR MASS around 9 a.m., when the church still huddles in a morning shadow. The oldest parishioners grab seats closest to the potbellied stove. History buffs come. Tourists. Friends of parishioners. Some bring folding chairs to expand the seating. Everyone else crowds together in the back. Spanish songs and hymns pour from a group up front. “Las Mañanitas,” “Buenos Días Paloma Blanco,” “O Madre Querida.” Father Jim stands next to me while waiting for the deacon to drive up with his vestments. I tell him that this is often the part of the story where we lament that a tradition may fade as adherents age and their children move on. He looks surprised. “I’ve never thought about it,” he says. “I would say the end’s certainly not imminent. That’s how continuous this tradition is.” Looking out, I count about 70 heads, but I know I’m missing many of the children seated between parents—the future heirs of these duties. The old pews creak and the wooden floors pop as people come forward for Communion. I remain seated, as do other visitors, but something has changed in the hour we have all been together. Fused by history and our individual commitments to be here, together, in this place, we who once were strangers have been welcomed in. We follow the procession outside, where a parishioner holds a cross, deacon Pat Valdez swings the incense, and four family members, young and old, hold the litter that carries Our Lady from bonfire to bonfire. They arc around the church, the choir singing, the bell thunking, the sun beaming, finally, on everyone—those who walk and those who watch. Afterwards, everyone lingers out front, chatting for whatever amount of time is considered neighborly. Soon people split off, bundling into cars that will take them to a buffet laden with platters of turkey and pork, vats of corn and beans, a tableful of cakes and pies, and a pot of red chile so dense with flavor that I will beg a recipe off its maker. All that will come. For now, I savor this moment, extending it just a bit longer. When I step inside the church, that same sole parishioner again says her prayers at an altar that has heard the prayers of so many. Taking a seat in the last pew, I close my eyes. 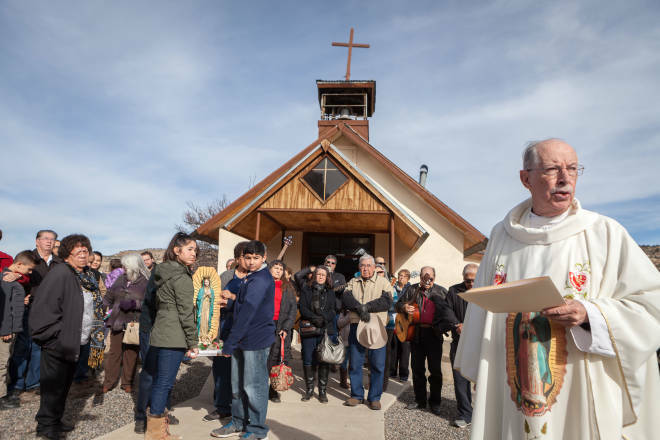 Our Lady of Guadalupe Church, near Navajo Dam, celebrates its annual Mass on December 9 at 10 a.m. Bring an extra chair if you can. All are welcome to the meal afterwards at the Saint Rose of Lima parish hall. To donate to the church’s upkeep, send a check to Saint Rose of Lima, 307 N. Church St., Bloomfield, NM 87413, and write “Care of Our Lady of Guadalupe Church” in the memo field.